The Rev. S.S. Rahn began working to organize the congregation of Christ Lutheran in March 1891. Four months later, a constitution was adopted and Christ Lutheran, Radford was born with a membership of 21. In 1895, Christ Lutheran Church, East Radford, was dedicated. The building which housed the original church stood on the present day campus of Radford University near the corner of Adams and Fairfax streets. The congregation stayed at this location for three years and then sold the building to First Baptist Church. After the building was sold, the congregation was homeless for 11 years, relying upon the courthouse, fire station or other churches for a place to worship. 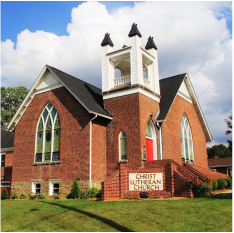 Throughout the next several years, the city of Radford began to grow, attracting more families and more Lutherans to the area, leading to the need of a permanent church building. The cornerstone of the present church on Harvey Street was laid in 1910. The new church building was dedicated in May of 1911. The church still stands there today. In 1920, stained-glass windows were installed in the building. They are believed to have been made in Germany after World War I.
Christ Lutheran Church has grown from a homeless little band of men and women to a congregation of hospitality in the community and a partner in the Synod. God’s people have been brave in the face of their defeats and disappointments, accepting their victories with a spirit of grateful humility. The church is ever reaching upward and onward toward more shining goals and beyond. More recently, the congregation has undertaken renovating the building to be completely accessible to people of all abilities, developed a new campus ministry, and is exploring new ministries of wellness and wholeness. Facing the 21st century, we are confident that God is with us and has a purpose for us in the New River Valley. The above information was taken from “Christ Is Our Cornerstone, One Hundred Years of Service”, written by Ann Giesen Fowlkes. 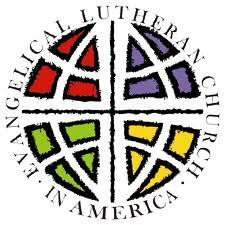 For a more detailed account of the history of Christ Lutheran, please call the church office at 639-2671.